If you would like your site included here, please drop us a line. We will accept any site that includes details of sputum flasks, of course! General medical sites are also welcome as this encompasses other aspects of tuberculosis and its treatment. 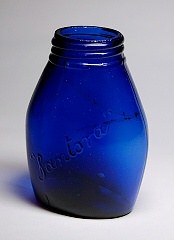 The British Antique Bottle Forum - forum for any bottle-related queries and help, like the Santora bottle (right). Bottle Digging UK - another bottle forum offering great help. Isle of Wight - Dr. Alan Champion's site, which details the Ventnor sanitorium and the finds from there. Dr. Champion was a GP there.